18 holes, par 70, 6515 yards. Parkland. 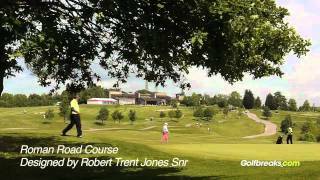 Designed by legendary course architect Robert Trent Jones Snr, the Roman Road is the oldest and probably the most natural course located at the world-renowned Celtic Manor Resort. Over the years the entire resort has earned a name for itself in terms of quality and customer service, and the Roman Road Course is no different. The Roman Road has received much acclaim over the years, regularly being ranked amongst the best inland courses in Wales by Golf Monthly Magazine. When playing this course you will always be greeted by breath-taking views across the Severn Estuary and Somerset. Throughout the 18 holes there is an excellent variety of long and short holes, open fairways, dramatic descents, and of course water hazards in abundance. The most memorable hole is probably the 8th – a long par three framed by large trees with a tricky sloping green. Whether you’re playing the Twenty Ten, Montgomerie or Roman Road, Celtic Manor will deliver you with an unforgettable experience. Golf carts are available from the golf shop for £30 per buggy – we would recommend booking these early in advance due to availability. Electric trolleys and pull trolleys are also available. We suggest that you book a cart due to the constant undulation of the course. None – only on the Twenty Ten Course.